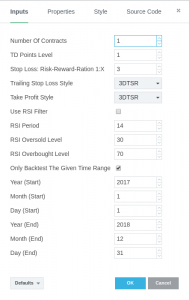 Reliable Alerts on Trendline-Breaks – based (but no official implementation!) on concepts and strategies of Tom DeMark. Use the Power of Trendlines without the need to draw them on your own! 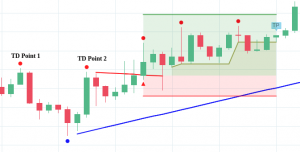 Automatic Trendlines – this will save you lots of time, using proven concepts by implementing TD Points level 1 – 3. The setup shown here is: TD Points level 3, Taking Profit via R:R 1:3, combined with 3DTSR trailing Stops. The red Trendline (it is a TD Supply Line) is automatically drawn via continuing the invisible Line that connects TD Points 1 and 2 (these are Level 3 TD Supply Points). At the red Triangle, a qualified Trendline-Break occurs and a Buy-Signal is fired. The red and green areas visualize the TP and SL Levels. The olive area appears, when the Trailing Stop Rules kick-in. The Screenshot to the Right shows the backtesting Results of XAUUSD on a 1H Chart. The Drawdown seems to be too high, but the Net-Profit is amazing! This is the Properties Dialog, showing the Settings for the above backtesting example.